There are an increasing number of new "social applications" as well as traditional application which either require the "social graph" or that could provide better value to users by utilizing information in the social graph. What I mean by "social graph" is a the global mapping of everybody and how they're related, as Wikipedia describes and I talk about in more detail later. Unfortunately, there doesn't exist a single social graph (or even multiple which interoperate) that's comprehensive and decentralized. Rather, there exists hundreds of disperse social graphs, most of dubious quality and many of them walled gardens. (...) If I had to declare the problem statement succinctly, it'd be: People are getting sick of registering and re-declaring their friends on every site., but also: Developing "Social Applications" is too much work. Five months later, Brad Fitzpatrick announced that Google will start to index FOAF files and the XFN microformats from web pages to gather publicly defined relations between people. For example, "XFN outlines the relationships between individuals by defining a small set of values that describe personal relationships. In HTML and XHTML documents, these are given as values for the rel attribute on a hyperlink. XFN allows authors to indicate which of the weblogs they read belong to friends, whom they've physically met, and other personal relationships." It's easy to edit the links from your blogroll to highlight your friends or your acquaintances. Google allows you to access these social relationships using a simple JSON API. The API could be used by social applications to discover some of your friends that already use the same application. "So you've just built a totally sweet new social app and you can't wait for people to start using it, but there's a problem: when people join they don't have any friends on your site. They're lonely, and the experience isn't good because they can't use the app with people they know. You could ask them to search for and add all their friends, but you know that every other app is asking them to do the same thing and they're getting sick of it." Since the data is already publicly available, this API makes it easy to discover your friends and let you select the ones you want to keep in the new context. For example, Bradfitz from LiveJournal has a friend Jane274. 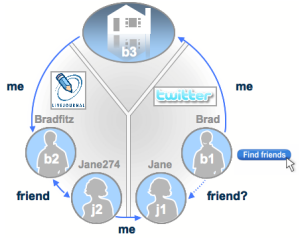 When Brad joins Twitter, the API could discover that he also have a LiveJournal page and his LiveJournal friend Jane274 is the same as Jane from Twitter. This way, Brad found a friend who has a Twitter account. Of course, the problem is that few people use FOAF and XFN to declare their relationships, but Google's new API could make them more visible and social applications could use them. Ultimately, Google could also index the relationships from social networks if people are comfortable with that. It will be cool to see how the possibility of connecting and profiling all our online social identities plays out. I'll be eager to see what Google does with this. Great post, interesting blog. Definitely Stumble- and Digg-worthy.